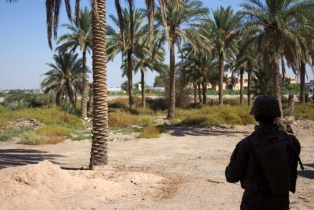 Iraqi soldier on patrol (copyright 2006 Craig DeBourbon, via iStockPhotos). December 22, 2006 (RFE/RL) — However, the one major caveat concerning the conference was that the participants were mostly all Sunni. While the object of the conference was to discuss the situation of the Iraqi people under the U.S. occupation, the current political crisis, and the seemingly unending violence, there was no denying the sectarian nature of the conference. The conference highlighted the “systematic marginalization of the Sunnis; the targeting of their ulema [Muslim scholars], imams, areas, mosques; and the liquidation of their men and women based upon their identity,” according to the final statement of the conference that appeared on the Muslim Scholars Association’s website on December 15. Moreover, the conference underscored the need for Sunnis throughout the Arab and Muslim world to assist their Sunni brethren in Iraq in the midst of the current sectarian violence. This call for assistance to the greater Sunni community could be a step in the beginning of a wider regional conflict. Speaking at the opening of the conference, Harith al-Dari, the leader of the influential Muslim Scholars Association, stressed that the crisis in Iraq is not a sectarian conflict, but a political struggle, Al-Jazeera satellite television reported on December 13. He said the struggle is not between sectarian beliefs; instead it is a struggle “between the Saddamists and takfiris [nonbelievers in God], on the one hand, and all the components of the Iraqi people.” In this case, the takfiris are those who are in collusion with the occupation. The leader of the Iraqi Accordance Front, Adnan al-Dulaymi, was less diplomatic in his language and stressed that the current crisis in Iraq is indeed sectarian in nature, with the aim of liquidating the Sunni Arab population. Al-Dari said the violence is not sectarian, but political. “It is a sectarian war. It is a sectarian conflict that aims to destroy the Sunnis. Anyone who thinks otherwise is wrong and must reconsider his position. He also must consider all the events that are taking place in Iraq,” al-Dulaymi was quoted by Al-Jazeera satellite television on December 13 as saying. The reaction among Iraqi Shi’ite and Kurdish politicians to the conference was swift and severe, with many condemning it for enflaming the sectarian divide. The head of the Supreme Council for the Islamic Revolution in Iraq’s (SCIRI) Badr Organization, Hadi al-Amiri, said he found it unthinkable for a conference to convene under the pretense for supporting the Iraqi people, but to only invite Sunnis. “We cannot accept this conference at all and we are against viewing it as a gathering for supporting the Iraqi people. We consider this conference an aggressive conference against the Iraqi people,” al-Amiri told Al-Jazeera satellite television on December 13. Indeed, the Iraqi government found the conference so distressing that the parliament’s Foreign Affairs Committee asked Prime Minister Nuri al-Maliki to review the commercial relations between Iraq and conference host Turkey, Al-Mada reported on December 19. There were reports that insurgent figures were either present or sent messages to the conference; one message of note was sent by the alleged spokesman for the Islamic Army in Iraq, Dr. Ibrahim al-Shammari. In an audio message, he warned that “many Sunni strongholds in the south had fallen” and stressed that “the [Iranian] Shi’ite aggression would continue into Kuwait and Saudi Arabia,” Al-Zaman reported on December 16. Iraqi Sunni leaders have long accused Iran of supporting the current Shi’ite government in Baghdad and arming and training Shi’ite militias, which have been widely accused of carrying out sectarian attacks against Sunnis. Interestingly, one of the participants at the Istanbul conference was Sheikh Nasir Bin Sulayman al-Umar, an influential Saudi Islamist. Al-Zaman reported that he was introduced as the director of the muslim.net website, which hosted the December 7 statement signed by 38 prominent Saudi clerics that called on Sunni Arabs throughout the Middle East to mobilize against Iraq’s Shi’a and to support its Sunni Arabs. The statement also warned that the occupation and the Shi’a were conspiring to dominate the region. Al-Umar was also a signatory of the statement. “The Crusader, Safavid [Iranian] and Rafidi [Shi’ite] scheme to which the Iraqi land and people have been subjected, and which was preceded by Ba’athist rule, is one chapter of the conspiracy and an indication of the success of the octopus-like scheme that is sweeping through the region,” the statement read. The clear sectarian nature of the Istanbul conference, on the surface, suggests that Iraq’s Sunni Arabs are moving away from national reconciliation and closer to civil war and perhaps a broader regional conflict. The warnings delivered by the likes of al-Dulaymi and al-Shammari concerning Iran are possibly attempts to align Iraq’s Sunni population with Sunni-dominated countries for what may turn out to be a proxy war against Iran within Iraq. Al-Hayat reported on December 16 that along with representatives from Saudi Arabia and Turkey, there were participants from Qatar, Egypt, Jordan, Pakistan, Algeria, and Morocco, all Sunni-dominated states. Furthermore, fearing an Iranian takeover of Iraq, Saudi Arabia allegedly informed the United States that it would intervene to support the Sunnis if the U.S. military pulls out. Indeed, a Shi’ite-dominated Iraq could influence the kingdom’s sizable and long-repressed Shi’ite population. With regards to Turkey, its role in hosting the conference seems to be its latest attempt to influence Iraq’s Kurdish population. Turkey and the Sunnis have one major thing in common: they are both opposed to federalism. The Sunnis are against it because it may lead to the breakup of Iraq, with the oil-rich north and south being controlled by the Kurds and Shi’a, respectively, while the Sunnis are left with the resource poor center. Turkey opposes Iraqi federalism because it fears an autonomous Kurdish north could lead to an independent Kurdish state, which in turn may incite Turkey’s large Kurdish minority to seek independence.